Grandpa Beck's Scheming and Skulking, a.k.a. 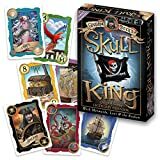 Skull King, is a trick-taking game similar to Oh Hell!, Wizard and Spades, with players needing to state how many tricks they think they'll win each round. Special cards can throw off your best efforts, however, so watch how others bid and play carefully. 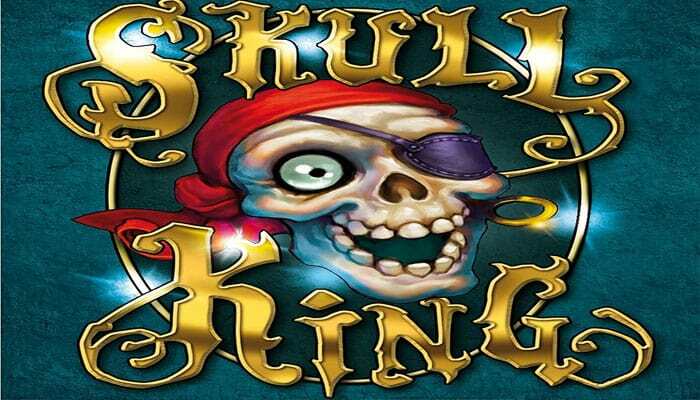 Skull King uses a 66-card deck that consists of five "escape" cards, four suits numbered 1-13, five pirate cards, 1 "Scary Mary" card, 1 "Skull King" card, and 2 mermaid cards. The game lasts ten rounds, and in each round, each player is dealt as many cards as the number of the round. All players simultaneously bid on the number of tricks they think they'll take by holding out a fist and on the count of three revealing a certain number of fingers (or possibly a closed fist for a bid of zero tricks). Standard rules apply for the playing of cards, with one player leading off a card and other players following suit, if possible, and playing something else if not; however, a player may always choose to play one of the special, unnumbered cards - and the power of those cards might let you win a trick that otherwise would have gotten away. In more detail, the black skull-and-crossbones suit trumps the other three suits, a mermaid trumps the black cards, a pirate trumps the mermaid, and the Skull King trumps everything - except if he appears in the same trick with a mermaid, in which case she seduces him and wins instead. An escape card can't win a trick, and the "Scary Mary" card serves as either a pirate or escape card as desired by the player. Whoever wins a trick leads in the next trick. If a player makes his bid exactly, he scores 20 points per trick; if he collects more or fewer tricks, he loses 10 points per trick he's off. If a player makes a bid of zero tricks, he wins points equal to ten times the current round number - but if he takes even a single trick, he loses this many points instead. If a player catches pirates with the Skull King, or the King with a mermaid, he scores bonus points. Whoever has the most points after ten rounds wins. What's all this nonsense about sea battles with thundering canons and grappling hooks! In reality it was all much more harmless! Venerable pirates preferred to hold their battles at gaming tables in shabby taverns using playing cards. The one who was not only able to wangle the most tricks from his opponent but also succeed in predicting them most accurately, won the contest.